Will the ingredients also remove other toxic metals such as cadmium, nickel, and arsenic? Do I take a mineral supplement while doing the heavy metal detox? Since these herbs remove mercury from my body, will it dissolve my fillings? What is the difference between the 2 bottle and the 6 bottle heavy metal cleanse? And what is suggested for Phase 1 of the detox? Can children do the detox? Is the chlorella "broken cell wall" chlorella? Although only tested for aluminum, lead and mercury, the heavy metal detox formula will remove all heavy metals to a similar degree. Like any chelation formula, it will chelate out a small amount of minerals, which is why Jon Barron recommends a maximum program of only 6 bottles, twice a year. Keep in mind, toxic metal levels are much less than major mineral levels in the body. By the time you remove 90% of mercury in your body, you lose only a fraction of a percent of major minerals, and they are easily replaced with diet and supplements. Pulling out amalgam fillings before the detox is not necessary. Simply repeat the detox slightly more often because you have a guaranteed source of mercury still in your mouth. Yes, there can be a mild exacerbation of symptoms as the mercury is being released from the body tissue by the cilantro and is in the process of being bound to the chlorella and passed out of the body. That should lessen as you continue the detox and the amount of mercury being chelated diminishes. A heavy metal chelator cannot pull out mercury pressed into a filling. All it does is break the electrical bond that ties the metals to body tissue (freeing the metals up), then binds to those freed metals and flushes them out in the urine. It has no impact on the mercury in fillings or on surgically implanted metal sutures, plates or pins. What is the difference between the 2 bottle and the 6 bottle heavy metal cleanse? And what is suggested for Phase 1 of the full body detox? After an initial cleanse of 6 bottles, a two bottle cleanse every 6 months should be enough to keep you relatively metal free – unless you eat a lot of high-mercury fish, or have more than a few amalgam fillings, in which case every 2-3 months is advisable. Incidentally, you do not want to use a chelation formula every day. Your body actually needs small amounts of some heavy metals. After an initial cleanse of 30-days, a 10-day heavy metal detox every 6 months should be enough to keep you in good shape - unless you eat a lot of high-mercury fish, or have more than a few amalgam fillings, in which case every 2 months is advisable. Incidentally, you do not want to use a chelation-type formula every day. Your body actually needs small amounts of some heavy metals. Yes, the Chlorella in the Metal Magic™ is "broken cell wall" chlorella. You say that the Metal Magic shouldn't be taken every day... is that still the case for the first 6-bottle detox? If so, how often should you take it? Every other day? It just means you want to stick to the detox schedule--either the 6 week detox or 2 week maintenance schedule--and then give your body a rest. Some people believe you have to detox daily, throughout the year, 24/7. We do not recommend that. While detoxing, yes, you do take it daily, as it instructs. This article is just a sales pitch with bad advice. 1. Why would you detox while still having amalgam fillings? That’s like trying to scoop water out of a sinking boat. REMOVE the source of toxins FIRST! 2. You’re not going to remove much heavy metals on a 30 day detox. It can take years to fully detox. First, not EVERYONE wants to get all their amalgam fillings removed, so should they just not detox at all? And fillings are not always the main source of heavy metals anyway. Second, you need to do your research on removing heavy metals. Years to detox? You are obviously doing something not that effective. See clinical study on removing heavy metals in 42 days and how it works. I have a mining lab, doing chem and fire assays. About 15 years ago my blood pressure and pulse rate dropped. If I did anything physical I would get dizzy. Fortunately a friend recognized my problem. Started detoxing program. Checking my urine using color metrics and using a time weight average for background, and checking my urine for gamma radiation. My urine was three times background in gamma radiation along with lead, iron, mercury, several others I tested for. After several months of detox, my blood pressure and heart rate returned to normal. About ready to go again, will your detox program work for me? 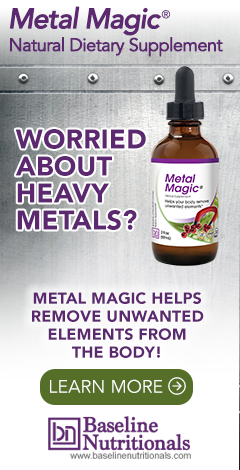 Will he Metal Magic remove heavy metals from the brain? Yes. Please read the article Why Do a Heavy Metal Cleanse? : "Chlorella possesses the capacity to absorb heavy metals... In studies undertaken in Germany, high doses of chlorella have been found to be very effective in eliminating heavy metals from the body – from the brain, intestinal wall, muscles, ligaments, connective tissue, and bone."